← It’s starting to look like Valentine’s…. On Friday night I had a wonderful Valentine’s Dinner with 5 of my friends – our Single Ladies Valentine’s Celebration! Not only was it a complete success but I think it may have been the best dinner I have ever thrown…and that says a lot! A welcoming and well dressed table is a great way to create instant atmosphere. For a romantic dinner for 2, the addition of candles alone can really set the scene. I scattered a few ghirardelli chocolates to add to the Valentine’s Day theme and also because it can be fun to have a little something extra to munch on at the table! 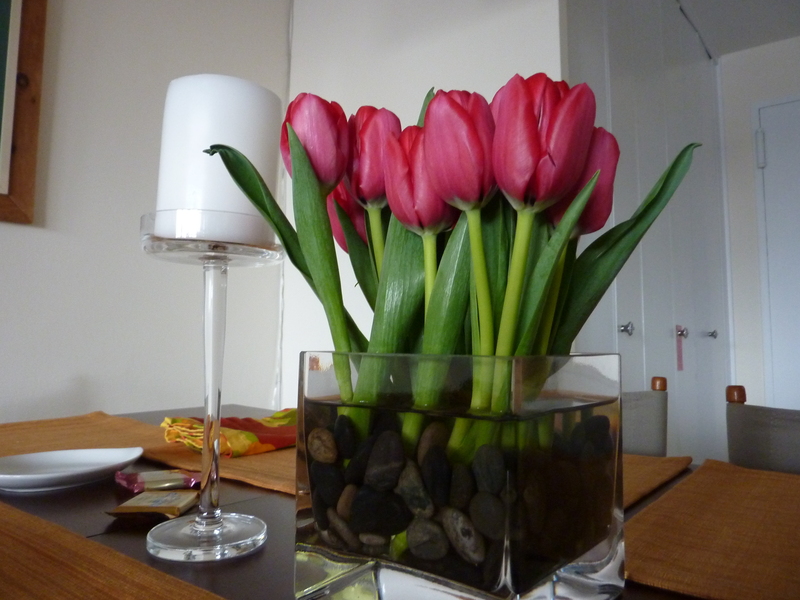 My linens are from Crate and Barrel and although I bought them for fall, the addition of red tulips alone helps the whole table feel season-appropriate. This simple centerpiece does a great job of elevating the entire atmosphere. In my opinion, both the square glass vase and river rocks are decorating essentials – I use both near constantly for dozens of uses. 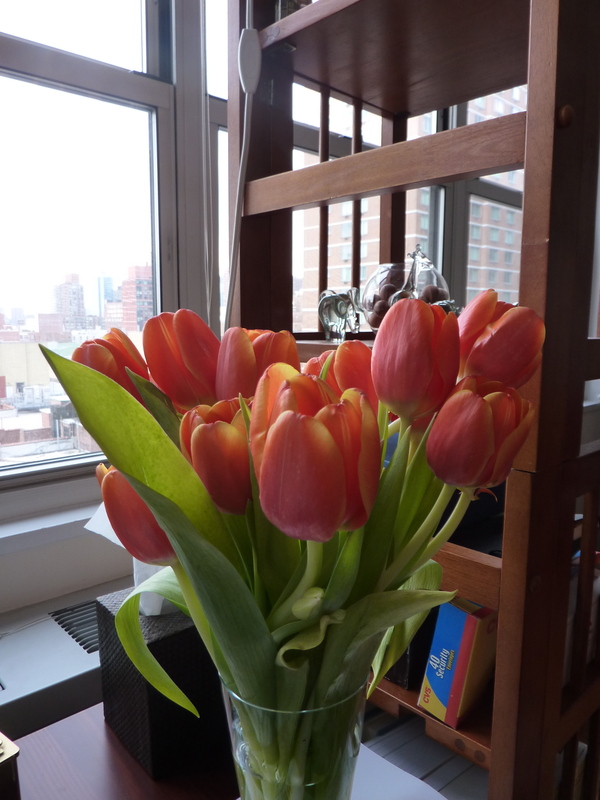 In this case all I did was trim down a grocery store bouquet of tulips (15 stems for $10!) and anchor them with the stones. For dinner, we started with two hors d’oeuvres and prosecco. I am a big fan of bubbly – starting a dinner with a glass of two gives an air of celebration and makes the whole event feel special. 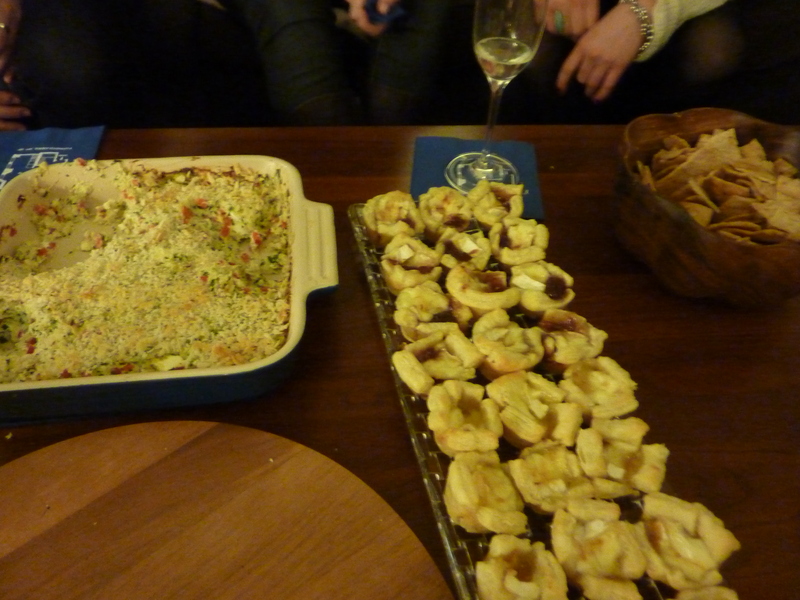 For hors d’oeuvres we had Baked Crab Dip as well as Baked Brie with Jam. The Baked Crab Dip really was a delight, and not as unhealthy as you may expect! Make sure to use great quality crab as well as whipped cream cheese as the recipe suggests. I used regular by mistake and ended up with clumps of cream cheese throughout the dip. I also omitted the hot sauce, which honestly was a mistake that just happened to worked out. The dip had an amazing light, almost refreshing, quality with the lemon – so I didn’t miss the heat at all! The Baked Brie really was a standout! I used Pepperidge Farm frozen Puffed Pastry, brie and two types of jam – strawberry preserves and Stonewall Kitchen’s Mimosa jam. 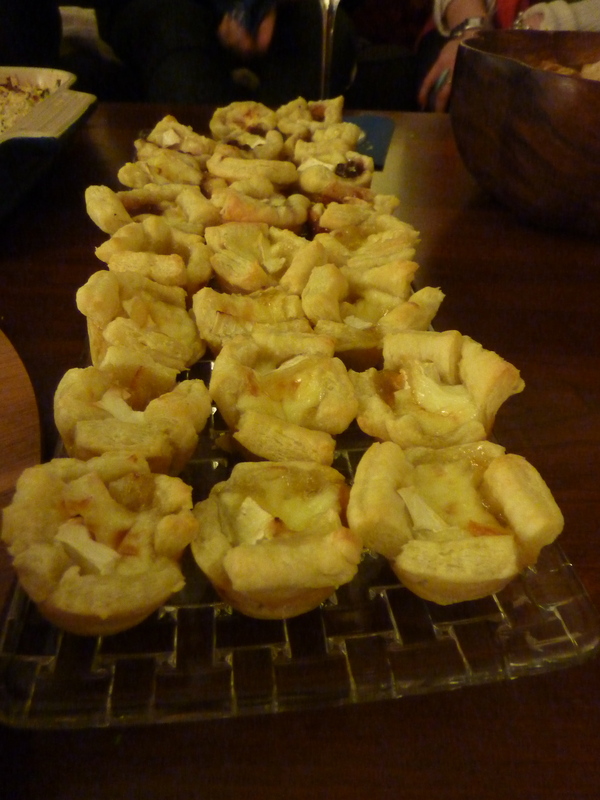 All you do is use the thawed puff pastry to make a little “cup” in a mini-muffin pan, fill with brie and a dot of jam then bake as directed for the puff pastry (in my case, 400 for 15 minutes). It really is a very easy drop of heaven! Dinner was one course and may be the best plate I have ever made! 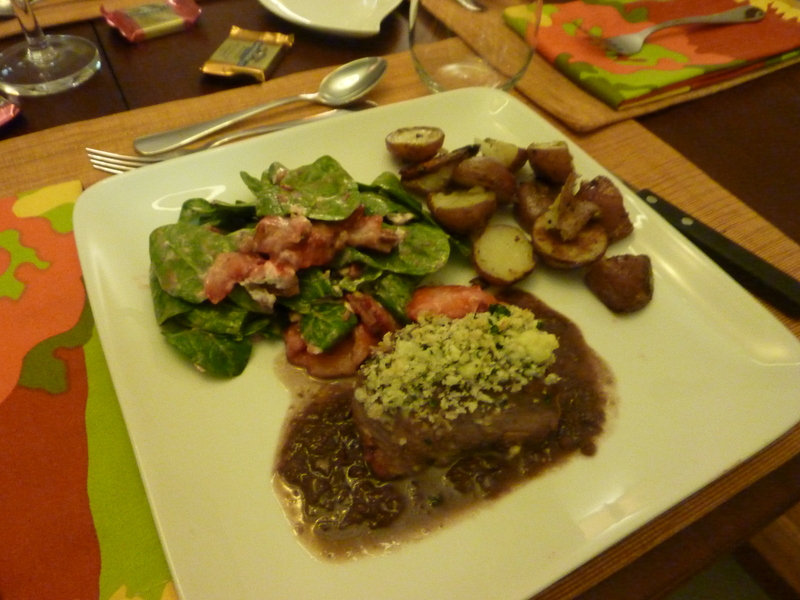 I served Blue Cheese Crusted Steak with Red Wine Sauce with Spinach Salad and Roasted New Potatoes. The Spinach Salad is my Mom’s secret weapon – strawberries, goat cheese and spiced pecans. One of my friends said that it may be the best salad she has ever had! The steak was incredible and although I wish the sauce was a prettier color, it worked great as a base for the steak – instead of my original plan to drizzle it on the plate. Desert was my favorite Chocolate Lava Cakes! 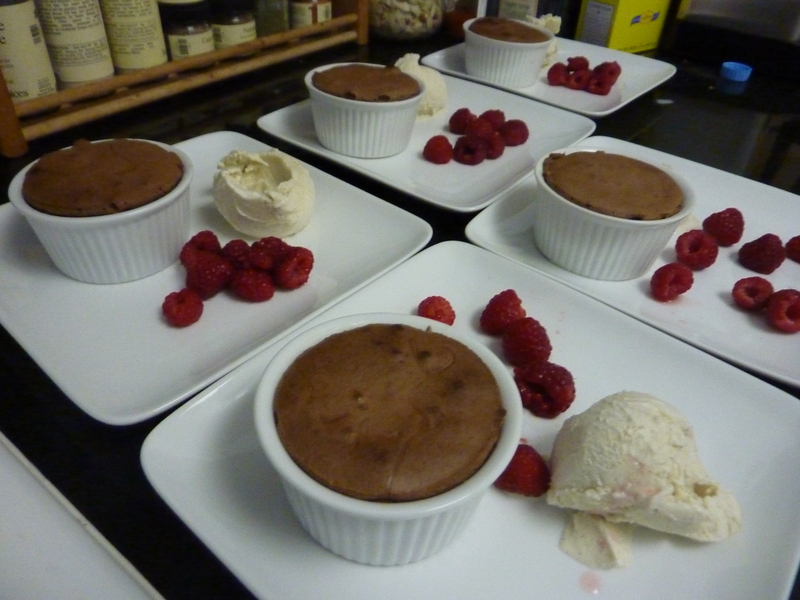 Although I failed (again) at being able to pop them out of the ramekins – we were all happy to eat them as is, with fresh raspberries and Haagen Dazs “five” vanilla ice cream! Happy Valentine’s Day everyone! No matter if you are celebrating with someone special or trying to ignore the day – treat yourself to something beautiful or delicious. Life is so short, let’s take advantage of the excuse and run with it! This entry was posted in Culinary Adventures, Entertaining and tagged Brie, Crab Dip, Dinner Party, Entertaining, recipe, Steak, Valentine's Day. Bookmark the permalink. 2 Responses to Valentine’s Success! 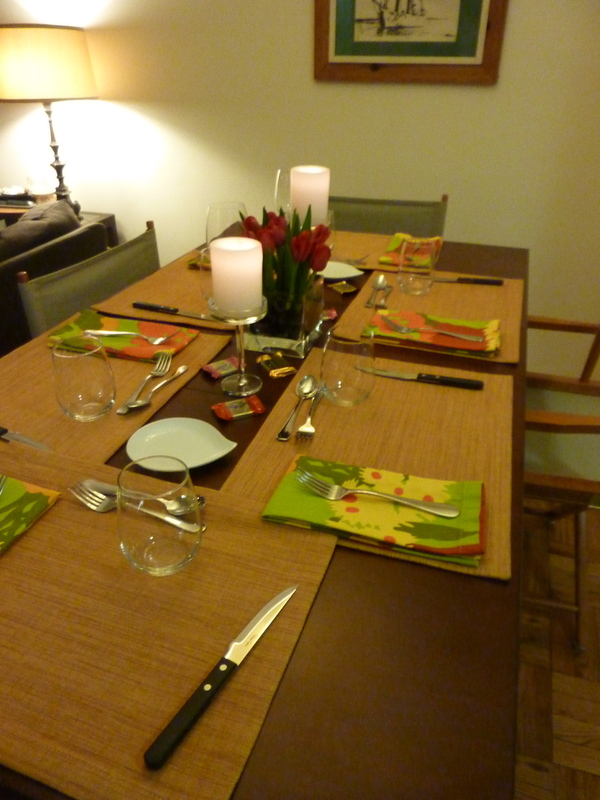 As one of the single ladies this valentine’s day I was thrilled to receive the witty evite to this dinner party. However, as the work week dragged on and NYC temps danced around 20 degrees, my enthusiasm in celebrating my single and fabulous self waned. Come Friday I ditched my planned cocktail dress, threw on a pair of jeans, and reluctantly headed up and west from my very east apartment towards Lili’s. Let me say… my mood completely changed when I walked into her warm and adorably elegant apartment. With a loud pop of the prosecco bottle an absolutely lovely evening began. The company was great… the playlist was perfect …the food was UNBELIEVABLE … I felt like I had just come from a five star NYC restaurant… really, that good.